Tuesday evening President Obama will present his State of the Union to the nation on one of the coldest nights in years. All 50 (57?) 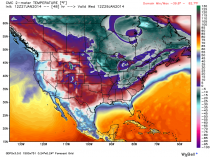 states will see sub freezing temperatures. 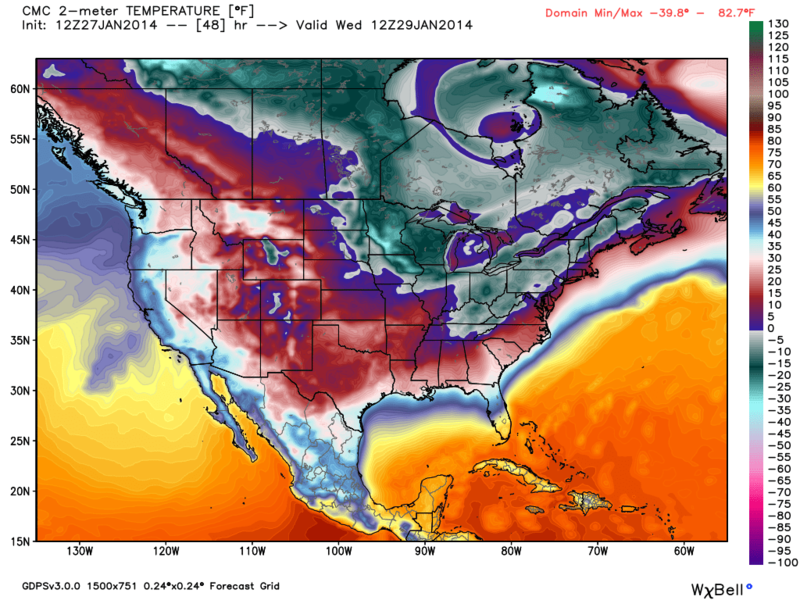 Up to 30 states will have temperatures drop below zero F! Snow will be falling from near Houston to New Orleans, the Florida Panhandle and the coastal Carolinas. 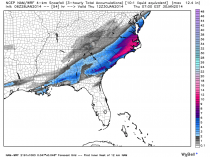 Models suggest Charleston, SC may get over 7 inches of snow, some models have a foot. 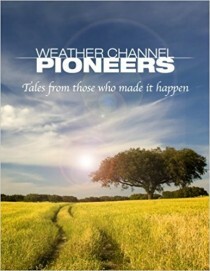 Charleston, SC’s modern record snowstorm is 6.6 inches in 1989. Some models exceed or even double that. In 2010, 3.4 inches (8.6 cm) fell on the evening of February 12, the heaviest in 20 years. 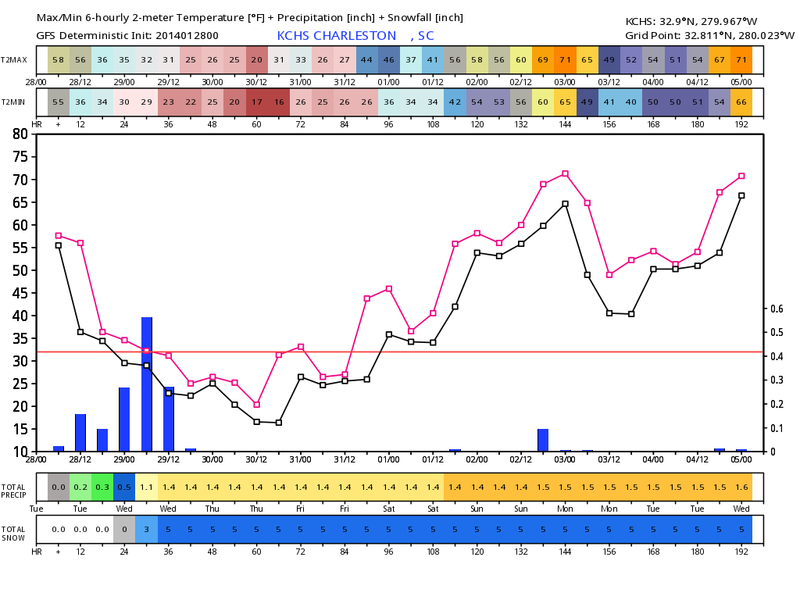 The record for Charleston was in January 9-11, 1800 when 8.1 inches fell. 7.1 inches fell on February 9-10, 1973. The nation is suffering from a serious propane shortage and with heavy icing on the nation’s lakes and rivers slowing or stalling barge traffic for grains and fuels. The President will no doubt reassure his green supporters he will continue his war on fossil fuels and support for alternative energy to fight the ravages of global warming. Despite any promises that renewables will save the middle class money, the EPA if not reigned in will cause the prices of electricity, natural gas and fuel oil to in Obama’s own words “necessarily skyrocket’. Suppliers might not have supplies to sell you as we saw in places early in January and may see this week/next month. Blackouts and brownouts will become more common in the years head. Unemployment will go up as it did in Spain (27.5%). All these problems have been experienced in Europe, where they are running as fast as they can away from the green agenda. We aren’t learning from their mistakes. The EPA is running rampant and the senate is proposing legislation to force unreasonable renewable energy standards. The Gore effect lives on. The lunacy continues. January 26th, 2014 by Roy W. Spencer, Ph. D.
I predict that, despite the brutally cold weather in DC this Tuesday, Obama will preach on climate change in his State of the Union address. I predict he will even use the cold weather as evidence to support his case. During his address it looks like there will be a wintry mix starting across the southern reaches of Louisiana, Mississippi, Alabama, Georgia, the Carolinas, and the Florida panhandle. I wouldn’t be surprised if he uses the event as evidence of human-caused climate change. Precip and cloud forecast for around midnight, Tuesday night. For those of us old enough to remember, similar events happened back in the epic cold winters of the 1970s. Many instances of snow falling in Florida in the 1800s surely weren’t due to humans. 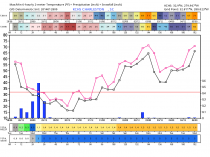 Believe it or not, more snow tends to go with colder weather, not warmer. Go figure. 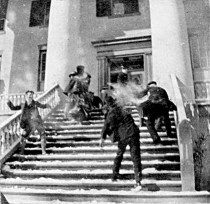 Snowball fight on the steps of the Florida capitol building, Feb. 10, 1899. 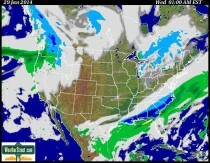 Has everyone forgotten that the global warming prophets predicted winters without snow? And there is no credible evidence that climate change (induced by global warming) can produce colder than normal temperatures. There has been no long-term change in mid-latitude storminess. One climate model out of a hundred might produce colder weather over less than 1% of the Earth with global warming....those are damn long odds to hang your hat on. But you know that if this winter was 20 deg. above normal rather than below normal, that would be used as evidence of global warming. Some people want to have it both ways. That sounds to me more like political spin than science. Still, I’m sure the President can find a few scientists who will support him. So he’s covered.